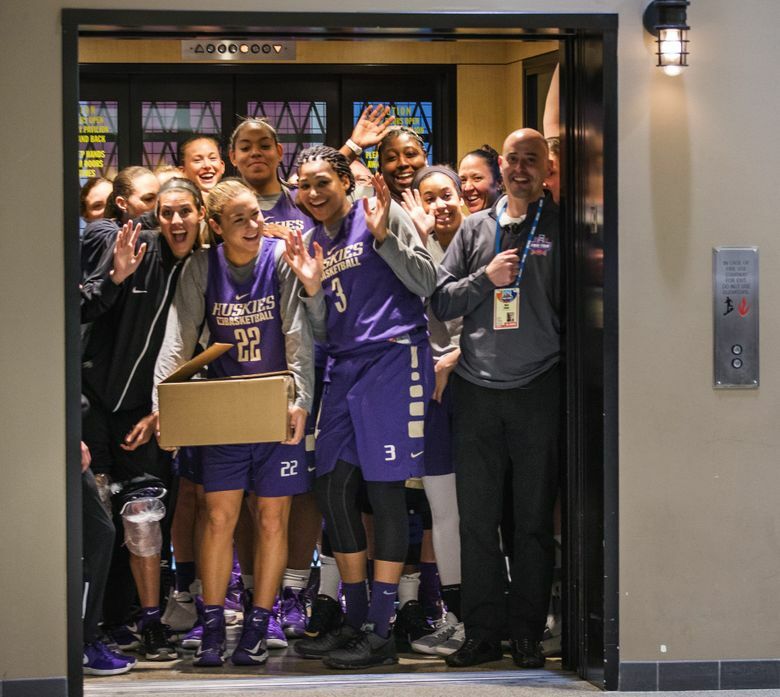 The Huskies knocked off three higher-seeded teams last year in one of the most improbable runs in the history of the NCAA women’s tournament. Mike Neighbors knows no other way to describe it. 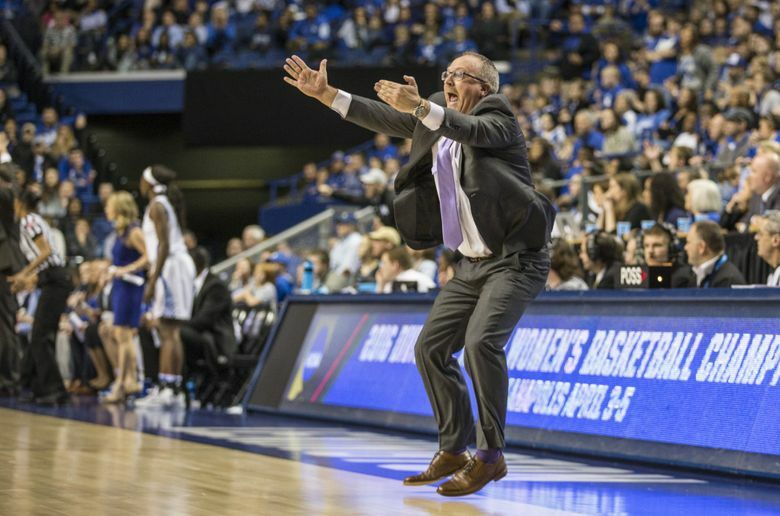 Over the past year, the words magical run have often been used — by him and by many others — to articulate his Washington women’s basketball team’s march to the 2016 Final Four. 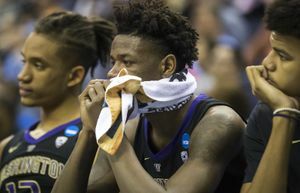 Three times over those two magical weeks last March, the seventh-seeded Huskies traveled back and forth from Seattle to the Eastern Time Zone — first to Maryland, then to Kentucky and then to Indianapolis for the program’s first Final Four appearance. Along the way, they knocked off three higher-seeded teams in one of the most improbable runs in the history of the NCAA women’s tournament. Men’s NCAA tournament selection show, 2:30 p.m., Ch. 7. Gonzaga is in the running for a No. 1 seed. A return to the Final Four isn’t out of the question for the Huskies this month. With star guard Kelsey Plum — named Thursday the ESPNW national player of the year — the Huskies have been ranked in the top 10 for most of the season, and Neighbors believes UW will a be “solid” No. 3 seed when the NCAA field is announced Monday. At 27-5, the Huskies will likely host the opening two rounds of the NCAA tournament next weekend. The Huskies’ tournament had an inauspicious start. Playing their first-round game in College Park, Md., the Huskies trailed 10th-seeded Pennsylvania 13-7 at the end of the first quarter. 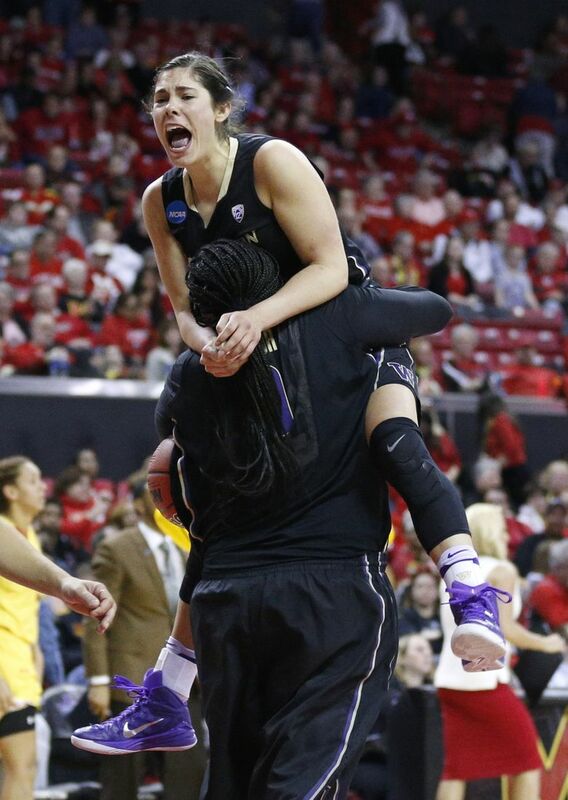 Plum (24 points, seven assists) led the charge en route to a 65-53 victory — UW’s first NCAA tournament win in 10 years. The deck seemed stacked against the Huskies two days later. First, the bus coming to pick them up from the team hotel arrived late; then the bus got lost en route to the arena. Awaiting them at the arena was host Maryland, which had entered the tournament ranked No. 5 in The Associated Press poll. Neighbors recalled chatter from ESPN pundits suggesting Maryland might be the best team to challenge UConn for the national title. The Huskies, as Neighbors recalled, found out late that the tipoff time had been moved up, leaving UW to scramble to the court for warmups. “Our team had adapted a really tough mentality on the road,” he said. “We had had so many crazy things happen to us. … It was terrible. They changed the tipoff time on us. We were in the (locker room) and they were like, ‘Hey, we’re tipping in 13 minutes.’ So it was just, ‘Well, what do you got for us next?’ And then it became this thing that, we’re ready for anything. Plum’s 32 points, six rebounds and seven assists sparked the 74-65 upset of the Terrapins, the first major upset of the tournament that pushed the Huskies into the Sweet 16 for the first time since 2001. The Huskies flew home to Seattle one day, then flew to Lexington, Kentucky. There they faced another daunting road test against No. 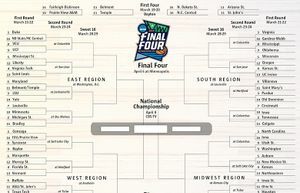 3 seed Kentucky, which hosted the Sweet 16 matchup on its home court, at famed Rupp Arena. With a rowdy blue-clad crowd of 8,509, the atmosphere was as good as it gets for college basketball. It hardly fazed the Huskies, who rode a torrid shooting performance from senior forward Talia Walton (30 points on 14-of-25 shooting) in a rather easy 85-72 upset of the Wildcats. Chantel Osahor, then a junior post, continued her sensational tournament with 19 points, 17 rebounds and five assists. Plum overcame a cold start to finish with 23 points, six rebounds and seven assists, helping set up an Elite Eight showdown with Pac-12 power Stanford, a No. 4 seed. A year earlier, in 2015, the Huskies had lost their opening game of the tournament — upset by 11th-seeded Miami — and Neighbors remembered the feeling then that the team had been happy enough just being in the tournament. The mentality flipped for 2016. Nothing seemed … enough. A few weeks before their Elite Eight rematch at Rupp Arena, the Huskies had knocked off Stanford in the Pac-12 tournament at KeyArena. And yet Neighbors said the “aura” of Stanford remained — and remained a hurdle for the Huskies on an even bigger stage. After all, Stanford coach Tara VanDerveer had led the Cardinal to the Final Four 12 times in her illustrious career — with two national titles — and the Huskies were still trying to get there for the first time. The calming moment, as Neighbors described it, came in the locker room before the game when he surprised his team and drew up the game’s first play for senior guard Alexus Atchley. To start virtually every other game, Neighbors would draw plays for Plum or Osahor. Atchley was as stunned as anyone by the play’s design, but she coolly worked around a screen and had an easy layup that started a 12-0 opening run for the Huskies. Osahor had two of her signature flat-footed three-pointers as part of the run, and the 6-foot-2 forward finished with perhaps the best game of her career in the 85-76 victory, which punched UW’s ticket to Indianapolis for the national semifinals. “Going through Stanford I think for these kids was — now you can do anything,” Neighbors said. The Huskies got contributions from all over. Walton had 12 points, seven rebounds and three steals; Atchley finished with 11 points; Katie Collier had six points and four blocks; and even seldom-used reserve Kelli Kingma hit two first-half three-pointers. Osahor was the difference, finishing with 24 points and 18 rebounds en route to earning regional MVP honors. “There’s never been a player like her,” Neighbors said Friday. In Indianapolis, No. 4 seed Syracuse used its relentless full-court press to end the Huskies’ hopes of reaching the national-championship game. 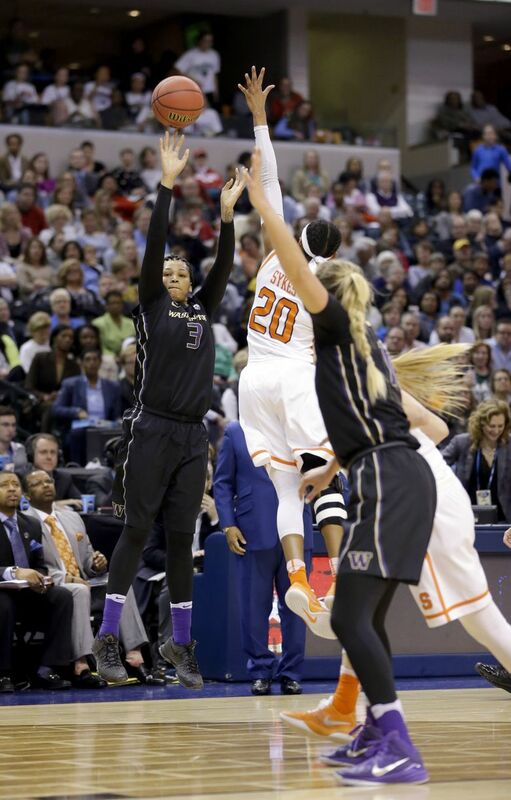 Walton was sensational, hitting her first eight three-point attempts — a Final Four record — and finishing with 29 points. But the Huskies committed 18 turnovers — after averaging 8.5 in their four NCAA tournament wins — in the 80-59 loss to the Orange. Mere minutes after the defeat, Plum was already looking ahead to her senior season, toward a potential return to the same stage in 2017. “Kelsey started in on me before we even walked into the (postgame) press conference — ‘We’ve got to get this, we’ve got to get that, fix that,’ ” Neighbors said. Neighbors stayed in Indianapolis for another couple days and watched UConn and Syracuse practice before their national-championship game. He studied and took notes; he made plans and envisioned being back on that stage again. “When you do get that close, and you see the razor’s-edge difference of advancing and not advancing, I think we’d have been crazy not to start taking notes immediately,” he said. With the experience of last year, with seniors Plum and Osahor at the top of their game, and with the opportunity to play at home next weekend, Neighbors is already envisioning another magical run.